Mark's Tickets is the best place to find tickets for Buffalo Bills fans. Just check this page for any new events or schedule updates throughout the year. We sell tickets to every Buffalo Bills game around the world. We know how passionate Buffalo Bills fans can be about football, so we make sure to have hundreds of tickets for every game available right up until it starts. For those looking for cheap Buffalo Bills tickets, we offer tickets starting at very low prices (many times below face value). We offer tickets in most sections of every venue that you can see Buffalo Bills. Simply choose the city or venue that you are interested in below, and you will be able to see all of the available seats. Do not forget that Marks Tickets also specializes in sold out Buffalo Bills tickets. No longer will sold out shows prevent you from seeing Buffalo Bills. The Buffalo Bills are a professional football team that plays in the NFL. 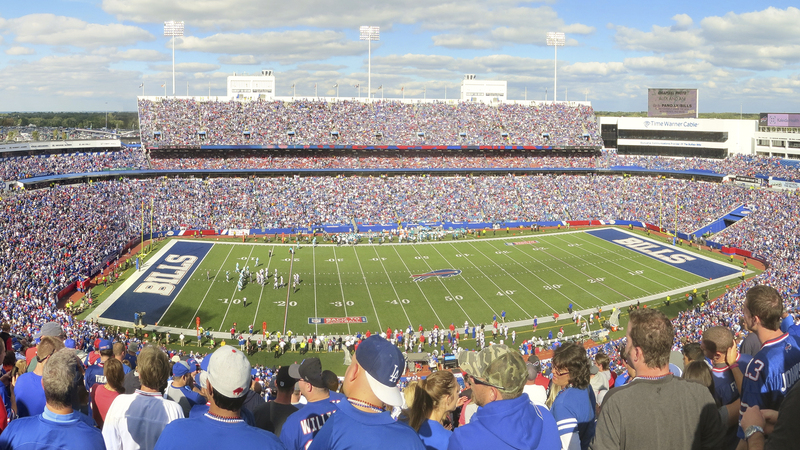 The Bills play their home games at Ralph Wilson Stadium in Orchard Park, New York. With 16 games per year, and 8 being home games, The Buffalo Bills are a professional football team based in Buffalo, New York. They are members of the East Division of the American Football Conference (AFC) in the National Football League (NFL). The Bills are the only team to win four consecutive conference championships, and are the only NFL team to play in four consecutive Super Bowl games, all of which they lost. They have had one owner, Ralph Wilson, and in their fifty-three years of existence, they have featured many prominent and popular players, including Jack Kemp, Cookie Gilchrist, Bob Kalsu, O.J. Simpson, Bruce Smith, Jim Kelly, Thurman Thomas, and Andre Reed. Since 1973, the Bills have played home games at Ralph Wilson Stadium in the Buffalo suburb of Orchard Park. The Bills are the only NFL team to play their home games within New York state. (Both the New York Giants and New York Jets play in East Rutherford, New Jersey.) Since the 2008 NFL season the Bills have played one regular season home game per season in Toronto as part of the Bills Toronto Series. The Bills conduct summer training camp at St. John Fisher College in Pittsford, New York, an eastern suburb of Rochester. In January 2013, Doug Marrone agreed to become the next head coach of the Bills. The Bills currently have the longest playoff drought in the NFL, having not appeared since 1999, and the longest active streak of losing seasons, having not finished .500 or better since 2004.